On January 6, the 2001 Chrysler PT Cruiser was unveiled at the North American International Auto Show. The spirit of experimentation leading to revolution is deeply etched in Chrysler's history, and the new Chrysler PT Cruiser proves that the spirit is as vibrant as ever. Loaded with innovations, the PT Cruiser again demonstrates Chrysler's dedication to creating vehicles that take inspiration from the past and redefine the future. 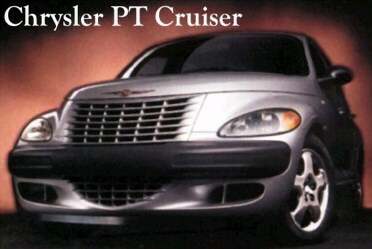 At the 2001 New York International Auto Show, Chrysler Group designers unveiled their latest custom interpretation convertible version of the PT Cruiser. There is no word when this will be offered as an official option. The unique styling of the PT Cruiser gives you the look and feel of the good old days of America, but it actually achieves quite functional packaging, giving plenty of space in the interior. While the interior styling is not radical, it does make use of materials that are to the character of this car. The engine included is a straight-4 DOHC with a displacement of 2.0L, generating 131hp. Obviously, this is NOT a racer, but more a daily driver with a vintage look and feel. Mated to this engine is a 4-speed automatic transmission. The suspension is a combination of MacPherson struts in the front and twist-beam in the rear. Moreover, a Watts link is added to the rear. There are two versions available, the Classic, which is the basic model, and the Limited, which is the luxury model equipped with leather seats and the like. This is one of the few cases of a concept car becoming a production car virtually unchanged, causing quite a stir in the U.S. when it was released. In fact, there are many reports that dealers were collecting premiums because the demand was so high and Chrysler could not keep up. If nothing else, you know you're doing something right when you can't make enough of them to go around. The PT Cruiser is not designed to be your one and only high performance super car, nor was it really even designed with racing in mind. But that doesn't mean you can't do some modifications yourself, right? As such, considerable credits are needed to bring the PT Cruiser up to full racing spec. When you do, you'll be pleasantly surprised with its quick and agile response.